WWE 205 Live results, April 17, 2018: Cruiserweight chaos reigns supreme! 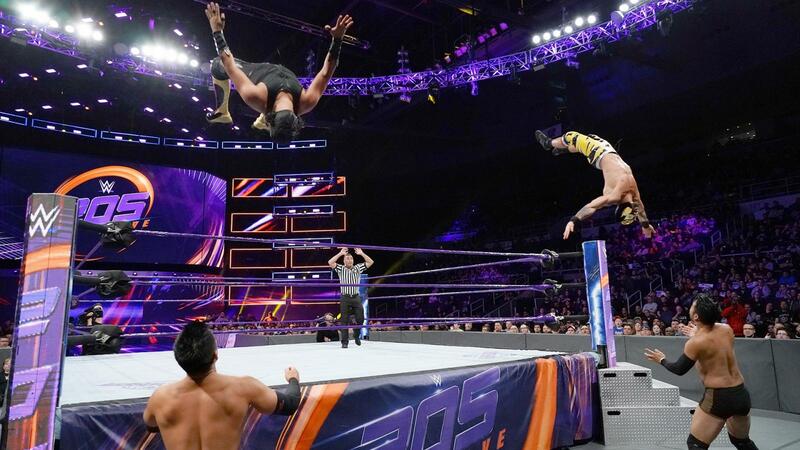 On the latest episode of WWE 205 Live, Lince Dorado & Gran Metalik battled Hideo Itami & Akira Tozawa in an effort to bring their heated rivalry to an end. Plus, General Manager Drake Maverick announces a huge match for next week. Before making his way to the ring, Ariya Daivari revealed that he requested a match with Mustafa Ali in an effort to show Ali that he tried and failed to win the Cruiserweight Championship and has to go to the back of the line. Once the opening bell sounded, Daivari charged after Ali, proving he was serious about putting his opponent in his place. Ali quickly recovered, but Daivari kicked Ali off the top rope before focusing his attacks on The Heart of WWE 205 Live’s back. The Persian Lion methodically attacked Ali’s back while taunting him. Showing his resilience, Ali tried his best to fight back, but the damage was done, and he struggled to maintain an offensive. When he appeared to have an advantage, he was quickly sidetracked by a hard-hitting spinebuster on the arena floor. Keeping the pressure on Ali, Daivari executed a series of high-impact strikes, but he was unable to secure a pinfall. Taking Ali to the top rope, The Persian Lion prepared a high-risk move, but Ali countered and landed on his feet as Daivari crashed to the mat. Seizing the opportunity to strike, Ali ran across the ring, ascended the ropes and executed the gravity-defying 054 for the win. Drake Maverick announces a Gauntlet Match for next week! Responding to Buddy Murphy’s attack on new WWE Cruiserweight Champion Cedric Alexander last week on WWE 205 Live, General Manager Drake Maverick revealed that despite his personal feelings about the attack, Murphy had done enough to earn a title opportunity. However, in a devastating turn of events for the Australian Superstar, Maverick informed the WWE Universe that Murphy failed his latest weigh-in and has been disqualified from competing on WWE 205 Live. As a result, Maverick announced a Gauntlet Match for next week to determine who will face Cedric Alexander for the WWE Cruiserweight Championship at the Greatest Royal Rumble event. Making his in-ring return after suffering a broken orbital bone on Christmas Day at the hands of Hideo Itami, former WWE Cruiserweight Champion The Brian Kendrick was prepared to show the Cruiserweight division he’s back and better than ever. Reteaming with Gentleman Jack Gallagher, he and the British Superstar were poised to use their aggressiveness and resume their mission of cruelty. Unfortunately for their opponents, The Man with a Plan and Gallagher took pleasure in unleashing pain and punishment. 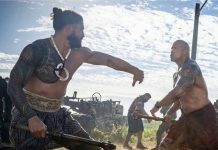 Despite moments of offense from their opponents, Kendrick and Gallagher remained in control throughout the contest, working together without missing a beat. The Man with a Plan also displayed an even more aggressive nature whenever he was struck in the face. That eventually translated into a perfectly executed Captain’s Hook for the tapout win, marking Kendrick’s successful return to the ring. The intensity between Lince Dorado & Gran Metalik and Hideo Itami and Akira Tozawa had gotten so high that WWE 205 Live GM Drake Maverick felt that only way to settling things was in the chaos of a Tornado Tag Team Match. Highlighting the tension, before Itami and Tozawa even made it to the ring, Metalik and Dorado attacked, and an all-out brawl commenced. Using their speed and agility, The Golden Lynx and The King of the Ropes kept their opponents on defense, wisely separating them by keeping Itami out of the ring and Tozawa taking the brunt of their attacks. However, the hard-hitting and resilient Japanese Superstars wouldn’t stay down for long, as Tozawa turned the tide on both luchas and Itami quickly joined in on the offensive flurry. Tozawa and Itami focused their attention on Lince Dorado, keeping Metalik reeling on the outside of the ring. The aggressive offense from the Japanese Superstars nearly resulted in Itami ripping off Dorado’s mask before they once again focused on a hard-hitting offense at The Golden Lynx’s expense. The heavy focus on Dorado eventually backfired on Itami and Tozawa, as a recuperated Gran Metalik charged into the ring and leveled both opponents. Removing both Tozawa and Itami from the ring, Metalik and Dorado executed a jaw-dropping synchronized moonsault to the outside. The match quickly devolved into a chaotic free-for-all on the outside of the ring that ended with Dorado battling both opponents on the top rope as Metalik recovered from being driven into the announce table. The King of the Ropes managed to recover fast enough to come to his partner’s aid and execute an incredible high-risk from the top. With Metalik and Itami reeling, Tozawa and Dorado slugged it out in the middle of the ring with The Stamina Monster taking control and executing his patented Senton for a near-fall broken up by Metalik. The battle continued to rage and the Japanese competitors found themselves again alone with The Golden Lynx. However, showing his own resilience, Dorado countered a double team effort with a double springboard stunner, much to the delight of the WWE Universe. Despite the flurry from Dorado, Itami struck and nearly secured victory until Metalik saved his partner and the luchas laid out their opponents. Freeing himself from Itami’s grasp, Metalik ducked a kick from Tozawa that leveled Itami. Taking down The Stamina Monster, The Golden Lynx and The King of the Ropes ascended to the top and executed two high-flying strikes for a hard-fought victory. After the match, Kalisto charged the ring to celebrate the victory with his lucha brothers, and The Lucha House Party was officially underway.